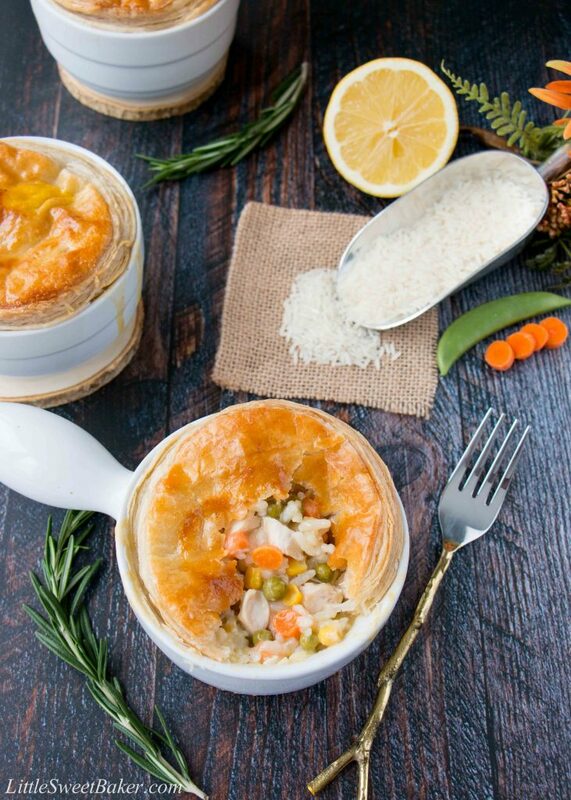 These mini chicken pot pies are filled with delicious rice, colorful veggies and succulent chunks of chicken baked in a creamy lemon sauce. 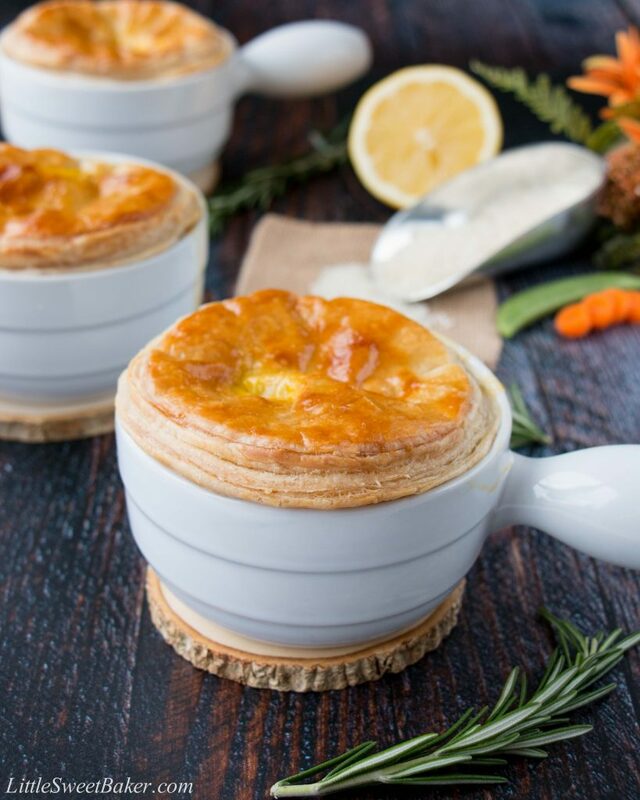 Topped with a double layer of buttery-flaky puff pastry, these mini pot pies are hearty and a perfect comfort food. This is a sponsored post. 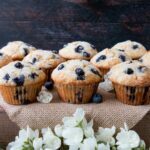 I had the wonderful opportunity to work with USA Rice Canada to create this recipe for you. Though monetary compensation was received, all opinions are my own. January can be a bit of a lull month for some people. Coming off the holiday-high, it can be tough to get excited in January. Especially with all this snow and extreme cold weather we’re experiencing here in Canada. So for me, during times like this, it’s all about comfort food – food that warms the heart and soul. Rice is the ultimate comfort food for me. Maybe it’s because I grew up having rice at almost every meal. It’s how my mother cooked and it’s how I remember eating as a family when I was a kid. Rice is versatile and so easy to prepare. You can pair it with any meats or vegetables and you have a meal. Canada does not produce rice, so rice that comes from the United States is as local as it gets. Rice grown in the U.S. is also consistent and good-quality. Rice is nutritious, low in calories, affordable and filling, so it’s great for feeding hungry families. I will often cook a large batch of rice on Sundays and use it throughout the week. Cook it once, and eating it multiple times makes it easy to meal plan and is a time-saver. This recipe uses cooked rice and cooked chicken, so it’s a good way to use leftovers. I used canned low-fat cream of chicken soup as a shortcut for the base of the sauce. I added some freshly squeezed lemon juice and lemon zest for a little citrus-tang and to brighten up the flavor of the dish. I topped it with a double layer of puff pastry for an extra flaky crust. These mini chicken pot pies tastes creamy with a soft lemon scent. They are packed with rice, chicken and veggies in a convenient one-bowl serving. 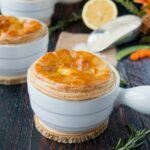 So feel good about serving these mini pot pies to your family because they are delicious and nourishing. Visit USA Rice Canada for more fabulous recipes and everything you need to know about rice. These mini chicken pot pies are filled with delicious rice, colorful veggies and succulent chunks of chicken baked in a creamy lemon sauce. Preheat oven to 400F. 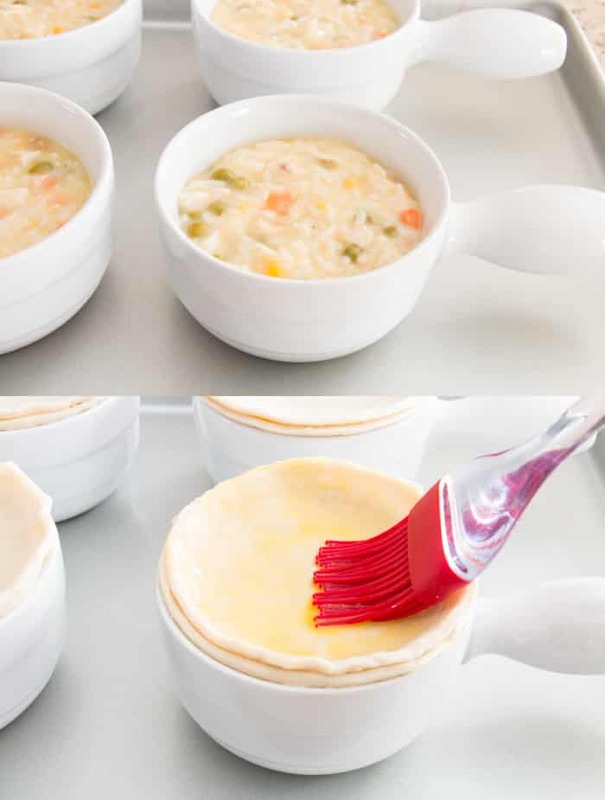 Set aside 4 soup bowls or ramekins on a baking sheet. Whisk together the soup with one can of water. Set aside. Heat the butter in a large skillet and saute the vegetables until cooked. Add in the chicken and soup mixture and bring to a simmer. Remove from heat, whisk in the milk, lemon juice and lemon zest. Stir in the rice and season. Spoon the filling into the 4 soup bowls or ramekins. Place the puff pastry on a clean working surface or cutting board and cut out 8 circles slightly larger than your bowls. Top each bowl with two pastry circles. Brush with egg wash.
Bake for 20-25 minutes or until the crust is golden brown and the filling is bubbling. Serve warm. I thought this was delicious. I didn’t end up doing the individual servings with the puff pastry though. I used a regular ole pie crust because that was what I had on hand. I love that my sister uses rice when she makes pot pies! I think it holds up better than potatoes so I was so glad to see this recipe with a little twist! Thank you for your lovely feedback, Ashlee! I’m glad you liked the recipe. Have a great weekend! I love the phyllo crust on top and the creamy rice filling is AMAZING!!! Thank you for your kind review Emily! You make savory pies too?! 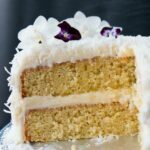 Here I thought you only make desserts, but clearly you’re superb at ALL things baked, sweet and savory both! Your family is very lucky! Thanks for cohosting, Lily, much appreciated. 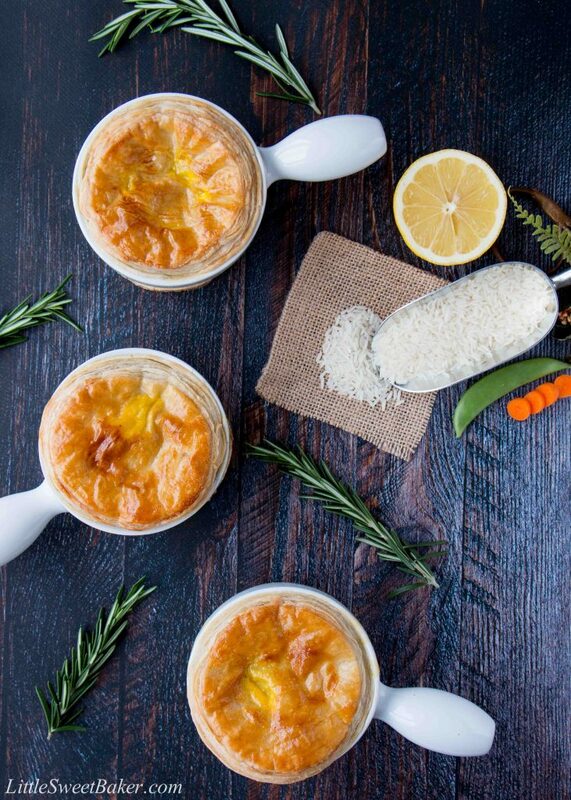 Rice pot pies sound amazing! And if you want to send me your features, there’s still time. Thanks again! 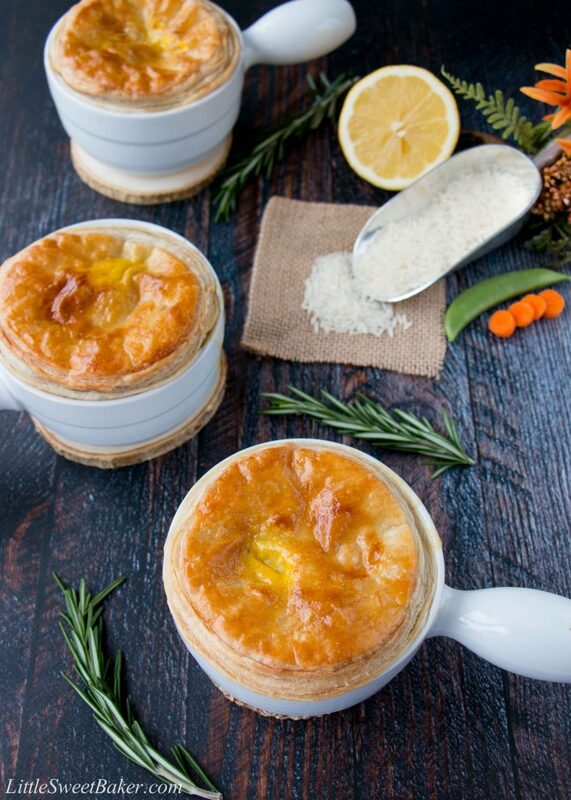 These little pot pies look so warm and comforting! I love the combination of lemon and chicken. I agree, this winter has got me reaching for comfort food more than ever with all the cold days!